This story is part of a special series on Americans' attitudes toward abortion in 2018. WASHINGTON, D.C. -- Sixty-two percent of Americans hold a favorable opinion of Planned Parenthood, the powerful pro-choice group whose high-profile role in the abortion debate has thrust it into the news once again this month. President Donald Trump and Republican congressional leaders are attempting to cut off federal funding for the organization because of its role as a major provider of abortions across the nation. Supporters of Planned Parenthood contend that most of the federal funds currently provided are not spent on abortions, but rather, they are spent on other health services the organization provides. Opponents argue that the federal funding frees up the group's other sources of income to be used for abortions. The nation has been nearly evenly divided on the issue of abortion in Gallup polling in recent years, with less than a majority identifying as either "pro-choice" or "pro-life" each time the question has been asked since 2009. But Planned Parenthood, though prominently identified with the pro-choice side of the debate, is viewed favorably by majorities of most major demographic groups -- including men and women, all age groups, all levels of education and all income levels. "Favorable" combines "very favorable" and "mostly favorable" responses; "Unfavorable" combines "mostly unfavorable" and "very unfavorable" responses. The latest findings are from a June 1-13, 2018, poll in which more than a third (36%) of those who say they are pro-life have a favorable opinion of Planned Parenthood. Even among Republicans, whose party has been battling Planned Parenthood since the 1980s, 36% have a favorable view. The 63% of Republicans who have an unfavorable opinion includes 24% who have a mostly unfavorable view and 39% with a very unfavorable view. Planned Parenthood has contributed at least $1,000 each to more than 100 Democratic candidates for Congress this midterm election cycle, while making no contributions to Republican candidates. Even among some key groups that are mostly pro-life and therefore might be expected to view Planned Parenthood negatively, majorities have a favorable view. Fifty-seven percent of those who have not attended college have a favorable opinion of Planned Parenthood. Fifty-four percent of this group are pro-life and only 39% pro-choice. Fifty-seven percent of those 50 and older view Planned Parenthood favorably. Fifty-two percent are pro-life and 43% are pro-choice. Fifty-two percent of those who attend religious services at least once a month view Planned Parenthood favorably. Sixty-two percent of this group are pro-life and 33% pro-choice. There has been little change in Planned Parenthood's image since 2015, the last time Gallup measured it. 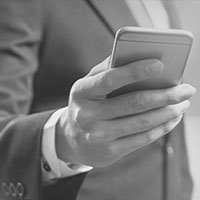 However, the organization's favorable rating is down sharply from the two times it was measured more than two decades ago, when roughly eight in 10 viewed it favorably. The high levels of support in 1989 and 1993 were measured during a contentious period for abortion. The 1989 poll, in which 79% of the public viewed Planned Parenthood favorably, was conducted after the Supreme Court announced it would revisit the 1973 Roe v. Wade ruling that made abortion legal nationwide. The 1993 poll, when 81% had a favorable opinion of Planned Parenthood, was conducted less than a week after an anti-abortion activist shot and killed a doctor who had been performing abortions. In the 1993 poll, more than two-thirds (69%) of Republicans had a favorable opinion of Planned Parenthood, along with 83% of independents and 91% of Democrats. 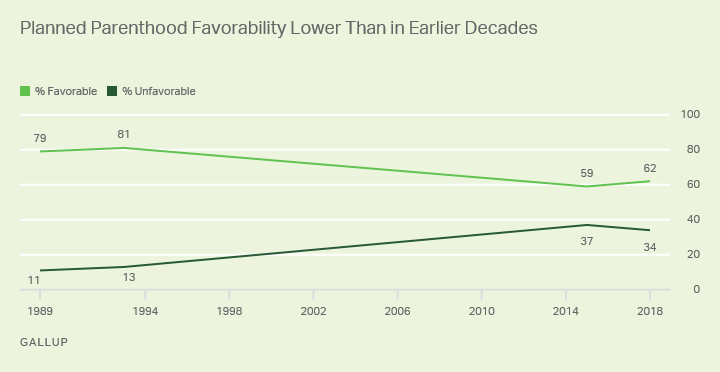 By 2015, Gallup polling showed only 35% of Republicans with a favorable view, and favorable views among independents had dropped to 56%. Among Democrats, there was a smaller decline to 82%. Now Democrats are almost back to the 1993 level at 89%, while the views of Republicans and independents have not changed significantly over the past three years. The abortion debate has been one of the defining battles of the nation's culture wars since the 1973 U.S. Supreme Court ruling made it legal nationwide, and Planned Parenthood has been at the forefront of the political and legal struggles throughout the years. In the process, it has often stood as a rallying point for pro-choice forces and a target for pro-life advocates. The organization has always emphasized that abortion is only one facet of its wide array of services, which include other forms of birth control, treatment of sexually transmitted diseases, and tests such as Pap smears and breast exams. While it is not clear whether Americans have a favorable opinion of Planned Parenthood because of its role in the national abortion debate or in spite of it, this month's polling offers further evidence that a solid majority of the public views the organization favorably, and that support is showing no signs of weakening in the Trump era. Results for this Gallup poll are based on telephone interviews conducted June 1-13, 2018, with a random sample of 1,520 adults, aged 18 and older, living in all 50 U.S. states and the District of Columbia. For results based on the total sample of national adults, the margin of sampling error is ±3 percentage points at the 95% confidence level. For results based on the two split samples of 755 and 765 national adults, the margins of sampling error are ±4 percentage points at the 95% confidence level. U.S. adults aged 18 to 29, and to a lesser extent those 30 to 49, express greater support for abortion rights than adults aged 50 and older. Women are slightly more likely than men to favor legal abortion and to identify as pro-choice on the issue, but these gender differences remain small.